The University of New Mexico was awarded a $500,000 grant by the National Science Foundation to improve campus-wide networking in support of research. The grant was submitted as the result of a collaboration between Information Technologies, Gil Gonzales, CIO and principal investigator; the Center for Advanced Research Computing (CARC), Susan Atlas, director and co-PI; and Greg Taylor, professor, Physics & Astronomy and co-PI. Additionally, 14 faculty spanning eight departments and centers are also collaborating including: Physics & Astronomy, Biology, Earth & Planetary Sciences, University Libraries, Psychology, the UNM Cancer Center, Mathematics & Statistics and Computer Science. This is the first NSF grant for cyberinfrastructure awarded to UNM. “The UNM Research Network will enable big-data-driven research and modeling, and will facilitate new and existing collaborations between universities and laboratories within the state and nationally,” said Atlas. “Advanced cyberinfrastructure is vital for a university and a state to compete in today’s rapidly-evolving scientific and technical environment,” added Gonzales. Mathematical modeling of Rayleigh-Taylor instability with slow reaction. 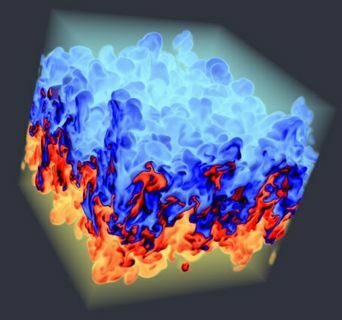 The research focuses on turbulence and fluid dynamics, with possible applications in chemical and nuclear engineering. Typical raw binary datasets range from several Gigabytes to several Terabytes in size. The faculty co-PIs and researchers collaborating on this proposal will serve as early adopters for the research network. Their labs will be the first recipients of the enhanced, dedicated Science DMZ connectivity on the 10/40/80 Gbps Research Network. “Their data-intensive research projects—many supported by NSF science grants—highlight the data transfer and synchronization requirements, data-sharing needs, and collaboration efforts, which are key network drivers for this project,” Taylor said of the faculty collaborators. Other faculty and collaborators on the grant include: Joseph Galewsky, Earth & Planetary Sciences; William Michener and Karl Benedict, University Libraries; Vince Clark, Psychology; Robert Miller and James Brunt, Biology; Scott Ness, UNM Cancer Center; Terry Loring, Daniel Appelӧ, Debra Sulsky, and Natalia Vladimirova, Mathematics & Statistics, and Jedidiah Crandall and Patrick Bridges, Computer Science.